How Hard Is Your Wood Floor? In the hardwood flooring industry, we measure the hardness of wood on the “Janka scale”. This measurement system has been used in its current form for about 100 years and is still very useful today. Testing is pretty simple. According to sizes.com, “The test measures the force required to push a steel ball with a diameter of 11.28 millimeters into the wood to a depth of half the ball’s diameter.” In the US, Janka are measured in pounds of force. Soft wood like pine might be just a few hundred Janka while a very hard wood such as rosewood might be several thousand Janka. A really hard wood is highly resistant to denting. But durability is not the only consideration in selecting your floor. You’ll also want a wood that you find visually appealing – and that fits your budget. Often, harder woods are from slower growing trees. This makes them scarcer and therefore more costly than softer lumber. There are coatings that can help woods that are lower on the Janka scale resist damage from foot traffic. So, don’t let the Janka number be your only consideration. After all, you probably aren’t going to be walking around with a ball bearing taped to your shoe to see if it dents your floor! Keep your dog’s nails short. Talk to a professional groomer or your vet about the best tools to use. The safest way to shorten a dog’s nails may be with a Dremel nail grinder. Use the Dremel gently and wear away the nails in stages over a period of several weeks so you don’t accidentally hit the “quick”. Add vinyl or rubber nail caps available from companies such as Soft Paws. You simply glue the caps onto your dog’s nails and they can run around on your hardwood floors without clicking or scratching. Put booties on your dog. This is a quick fix as long as you can train your dog not to pull them off. Choose a style with non-skid soles to keep your pet from slipping. Finally, talk to your local hardwood flooring specialist about finish options that are most scratch and slip resistant. And remember, most surface scratches that just affect the topcoat on the floor can be buffed out. No need to yell at your dog about a few nail marks! If you live in or around the D.C. Metro area, you know that housing prices are pretty steep. That may seem like a good thing if you are getting ready to sell your home. But whether you want to upgrade to a nicer/bigger place or downgrade to fit a tighter budget, you still need to get every penny your current home is worth when you sell. Otherwise, you might have to move pretty far afield to afford a new place. 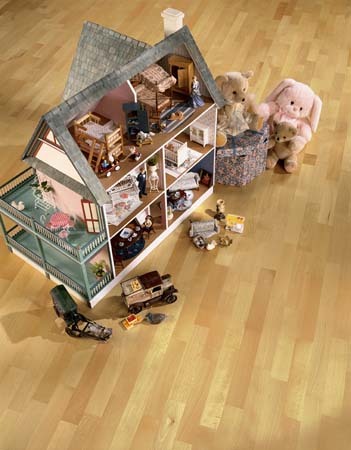 According to BankRate.com, flooring is one of the top ten aspects of your house that affects its perceived value. House shoppers are enamored with natural materials. The realty expert quoted in the article linked above states, “We’ve gone back to a real appreciation for historically true materials”. It doesn’t get any more historical than an original hardwood floor! Of course, you probably don’t want to invest in a brand new wood floor right before you sell your home (save that money to get hardwood floors installed at your new place!) That being said, you will want to get your current wood flooring refinished or touched up to make it look its best. Thankfully, this is a lot easier than making old carpet look new again. Full thickness hardwood planks are designed to be sanded and stained to restore them to fantastic condition. That’s an affordable way to boost the sales price of your home. Buyers will fall in love with your floors from the moment they step across the threshold. We hate to say it, but the hardwood flooring industry has a serious swatch problem. Interior designers can easily carry around hundreds of fabric samples to show their clients. But physical flooring samples get unwieldy pretty fast. If you make them small enough to tote around, it’s really hard to picture how the material will look when it covers an entire floor. If you go with larger pieces of wood, each one can easily weigh in at a half a pound. It’s no wonder typical sample collections only offer a handful of choices. Then there’s the cost. At a flooring store, you may be expected to pay for every sample you want to take home with you. Or you might be saddled with shipping and processing charges for “free” samples you order online. Sadly, many homeowners think they have to simply settle for a limited selection or shell out big bucks to look at all the options they’d really like. At Residential Floors, we don’t think floor shopping should be that way. That’s why we feature the Design a Room app on our website (find it on our home page here). You can view literally hundreds of fine flooring samples in every imaginable wood grain and color. Every option is shown as a wall-to-wall installation in completely furnished rooms. Pick the room you want to see and choose the décor style that most closely matches your own home. Then, just start clicking to find the ideal floor. It’s like having an interior designer bring a whole truckload of sample hardwood flooring swatches right to your doorstep – only less messy!